I don't know the proper name for this, if it has one, but found a pocket of crystals with faint purple "ghosts" inside them. Don't know if it's purple enough to count as 'real' amethyst but I think they're neat. Let me know if the photo doesn't show up and I'll rehost it. Interesting. Are you trying to recall the word "phantom"? That is when there are traces of interruption during the crystallization process (i.e., you see crystal faces, or even entire crystals, encapsulated within the crystal after it started growing again). Where (generally) did you find it? 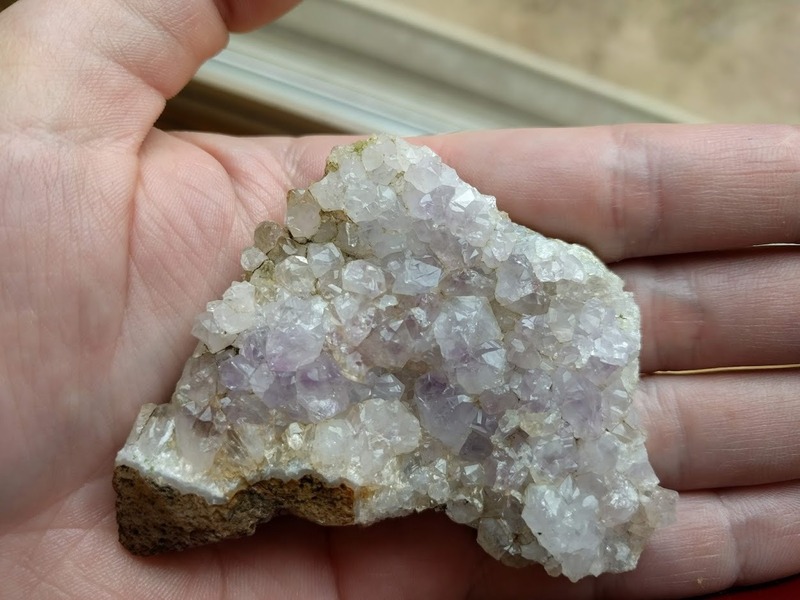 I've heard of people finding amethyst on either side of the central Cascades (southeast of Eugene and west of Sisters). They count , nice find. I'm not sure I'd call them phantoms. Judging from the image it appears iron was available in the feedstock briefly during crystal formation, leaving little amethystine traces. They'd make interesting faceted stones and unusual cabs. Yeah, ghost or phantom, I wasn't sure if either term was correct. These crystals are the middle layer of three. The top and bottom layers of crystals don't have the color in them, just this one middle layer and all at a similar horizon. Area is Antelope/Ashwood. The only other purple crystals I've seen from the area had color at the point, not in the middle. I will try polishing some by hand when it's warm outside again! Some also exhibit internal fractures with colorful flash. There are legends of a large amethyst geode found in the area a few decades ago, half of which is rumored to be at the Smithsonian. Not entirely sure if I believe that one! Those are really nice! Great find. I bet that would make an amazing faceted stone. If you want to try, I'll send you a couple crystals if you'll send me one back! They are where they are. I won't say where but a friend found an eight inch long deep purple amethyst crystal about 75 miles away from the nearest known location in the north Cascades. a lot of the west has never been looked at closely. Faceting requires super patience. That will never be me. But if you find someone, be sure to post results. Oregon coast, 101 East up the Wilson river. 2 mile hike, seam & geodes with amethyst crystal. And up around Timothy res. is larger points of light color amethyst.